If you have an old PC collecting dust or a spare laptop you rarely-to-never use, then you should definitely turn it into a wireless router. Think about it – it’s much more flexible in terms of connections you can use than a regular dedicated router: supports Ethernet, Wi-Fi, 4G and any other connection types via USB adapters). Plus if you want to turn an old laptop into a wireless router, it’s easy to move it around even when no power outlet is around. Read below to see how easy it is to turn your Windows computer into a fully featured Wi-Fi router with the help of Connectify Hotspot software. 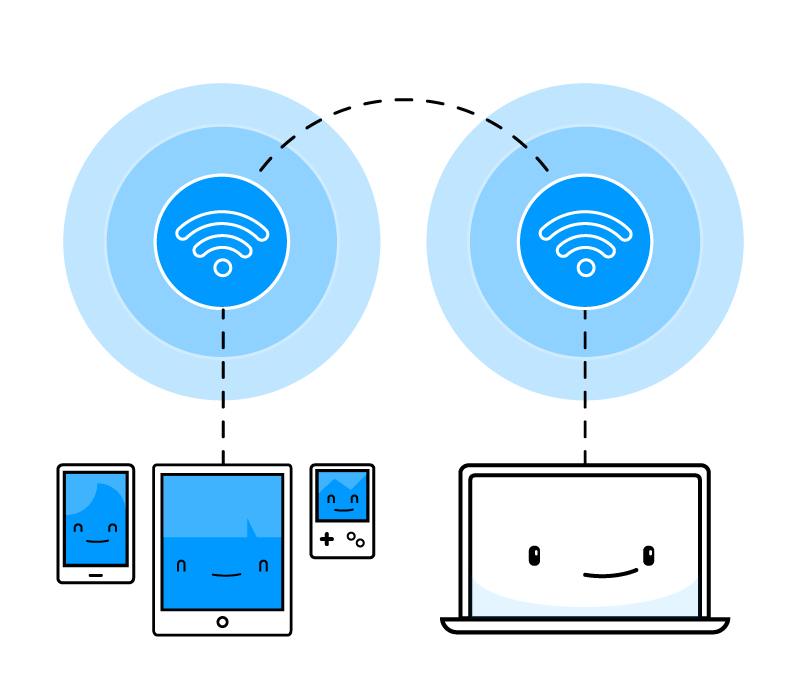 It’s all there: sharing any Internet connection with other devices, extending the range of a wi-fi network, bridging network connections, universal ad blocking and firewall controls. The first and main use for a wireless router is to share an Internet connection to other devices via Wi-Fi or Ethernet. As you know, the newer versions of Windows have built-in capabilities to share a Wi-Fi network or bridge connections, but they are very limited in terms of functionalities and require some technical knowledge, time and a lot of steps to get it going. This is why Connectify Hotspot is the most popular virtual router software used by millions of people around the world. It literally takes less than 5 minutes to configure an old WIndows PC or laptop into a powerful wi-fi router. 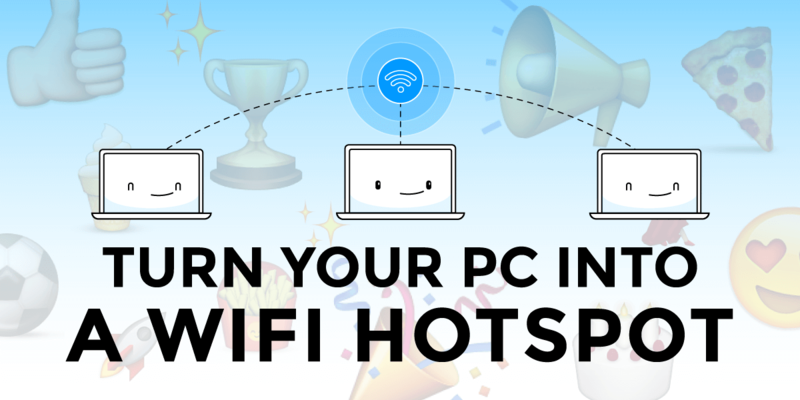 You will be turning your PC into a wireless hotspot! With Connectify Hotspot MAX you can share any Internet connection (Wi-Fi, 4G, wired, VPN, others via USB adapters) via Wi-Fi or Ethernet. To turn your laptop into a wireless hotspot and share the Internet connection over Wi-Fi, just select it under ‘Internet to Share’, give the Wi-Fi hotspot a name and a password and you’re ready to go! See the video below! Naturally, if you’re using a PC and want to turn it into a wi-fi hotspot, you have to make sure it has a wireless adapter installed – usually available via a USB adapter or even onboard for some configurations – check your system / motherboard manual and BIOS. You can also share the Internet connection via Ethernet, if you have devices that don’t support Wi-Fi – for example – older game consoles such as PlayStation, Xbox or Nintendo. Connectify Hotspot MAX makes that possible – as before, you just have to select the connection under ‘Internet to Share’ and you’re done – see video below for illustration. One last thing about sharing connections: for every connected device, you have firewall controls available – you can choose whether you want that device to have access to the Internet and Local network. As a powerful virtual router software app, Connectify Hotspot also works as a repeater and range extender for your Wi-Fi network. To set up Connectify Hotspot MAX as a Wi-Fi repeater you must already be connected to the network you want to extend. Then simply click on the ‘Wi-Fi Repeater’ button at the top of the program interface, make sure that the Wi-Fi network you want to repeat is selected and start your Hotspot. It’s that easy! See video below. If you want to bridge network connections – add devices to your home network as if they were directly connected to that (game consoles, streaming devices, network attached storage devices, etc. ), then Connectify Hotspot MAX can help with that. Just select the Bridged option under ‘Network Access’ in the app – more details in the video below! Looking for a way to save time, bandwidth, money and battery life for all your devices connecting to the home network? You’re in luck – Connectify Hotspot is more than just a virtual router; it also uses universal ad blocking technology to help you save 60% of your bandwidth on average. Universal ad blocking means that it will block ads not only from websites, but from within apps too. So, if you’re connecting via your iPhone or Android smartphone to the Internet via the hotspot created with Connectify, you will not get any pesky ads within the ad-supported apps you may have on your mobile phone. Great news, right? Convinced yet? Connectify Hotspot is clearly the best solution to turn your old Windows computer into a powerful wireless router. Get started with Connectify Hotspot MAX now at 70% off!